We thoroughly enjoyed our trip to Poland, the first time for both of us. We thank you for making us feel so welcome. It was a pleasure to be amongst you all and to share in our mutual love and admiration of the Golden Retriever breed. 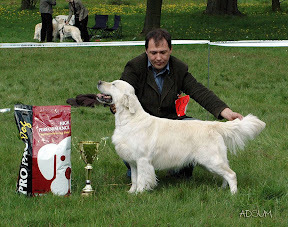 We found overall that your dogs were soundly made, of a good size and substance, and moved accurately. However we were both most perturbed that we found three young dogs whose temperament was not of the expected confident and gentle nature we would normally expect. Neither of us has ever before experienced this anywhere in the world. Possibly this is due to a lack of Ringcraft experience and socialization? 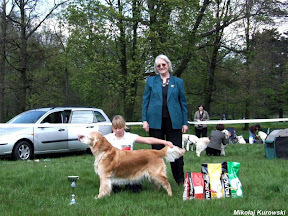 More practice in standing the dogs would also help your general handling and presentation. 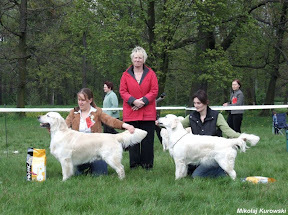 As a general observation shoulders were lacking good angulation and length of upper arm, this is not just a problem in Poland, but seems to be worldwide, breeders must be aware of this. 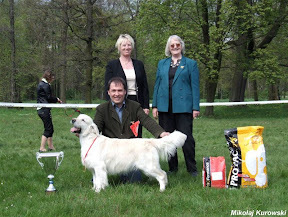 We both felt that our winners of the classes were very pleasing and up to a good standard. There was a lovely relaxed “garden party” atmosphere around the ringside.